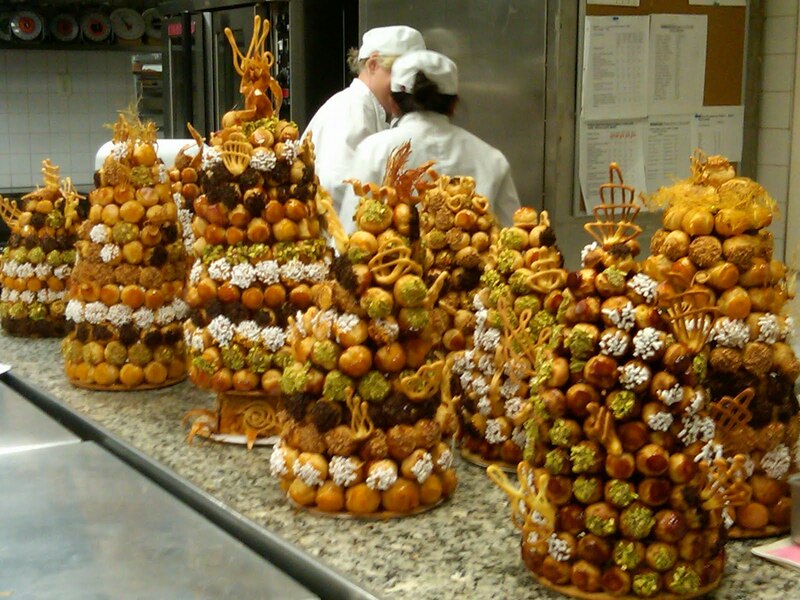 My partner and I spent all day making this Croquembouche. I am not sure how applicable this skill is to me after today's class, but it was a lot of fun putting this thing together. It's the perfect thing to do on a Friday class. 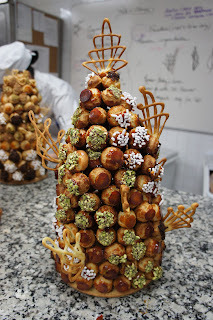 The process of using caramel to glue individual puff pastry into this crazy looking tower was quite therapeutic. Croque en bouche means "Crack in the mouth" in French, which is just what it is when one bites into the individual profiterole. This is supposedly served at weddings, bnaptisms and first communions. Could this trend make a come back replacing the tiered wedding cake? I saw this cake in one of my mom's Korean soaps! 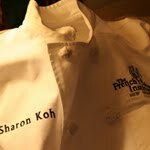 The main character was a talented patisseur who was trained in Paris..and she had made this cake for her ex-boyfriend's engagement party. I had never seen this cake and was wondering why bake a cake that looks like Louis XIV wig! But now I understand. Looks like you have like 70 balls per cake? Does it "Crack in the Mouth" also stand for what will happen to bonding on your teeth if you eat it with all that caramel? ?